The Western US and a century of drought; welcome to the new normal. I recently saw this livescience.com article on Yahoo. The article discussed how drought conditions in the western US, particularly the western forests, will become more commonplace in the next century. This change in climate could cause much of those forests to give way to scrub land, an ecosystem more suited for the lower rainfall rates. Living in New England, its hard to imagine drought conditions. We occasionally see some short-term droughts that drop river levels and bring about red flag warnings, but by the end of the year we always get our 40 inches or so of liquid precipitation. The west, particularly the southwest, sees much less rain on average and has a history of severe droughts. If there’s anything we’re starting to realize about climate change, it’s that extreme weather is becoming more commonplace. Dry climates are getting drier and wet climates are getting wetter. Extended droughts and devastating floods will happen with increased regularity. 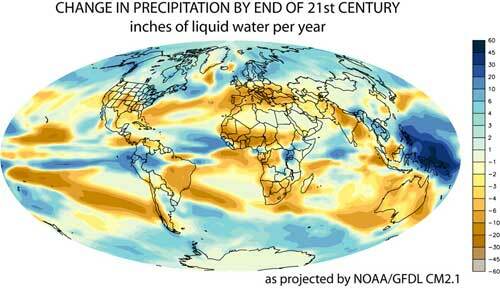 Compare the annual precipitation map to this next image; a prediction of the change in annual average precipitation by the end of this century. You’ll notice that for the most part, the western US is predicted to receive less rain and the eastern US is predicted to receive more. Except for a portion of the southeast, drier areas get drier and wetter areas get wetter. And for a state like Utah, where large areas see less than 10 inches of rain per year, a decrease of only one or two inches annually is massive. If these climate forecasts prove true local ecosystems will need to adapt or perish. In the case of the western forests, that change could be a transition to scrub land. This would be terrible for not only the flora and fauna of the forests, but anyone who love’s their beauty or makes a living off of them being there. Here’s a good article from NOAA’s Earth System Research Laboratory on the Intergovernmental Panel on Climate Change. I don’t want this blog to ever get too political, but I will admit I’m a firm believer in climate change. From time to time I hope to post about new climate change stories in order to raise awareness and explain the science behind the claims.